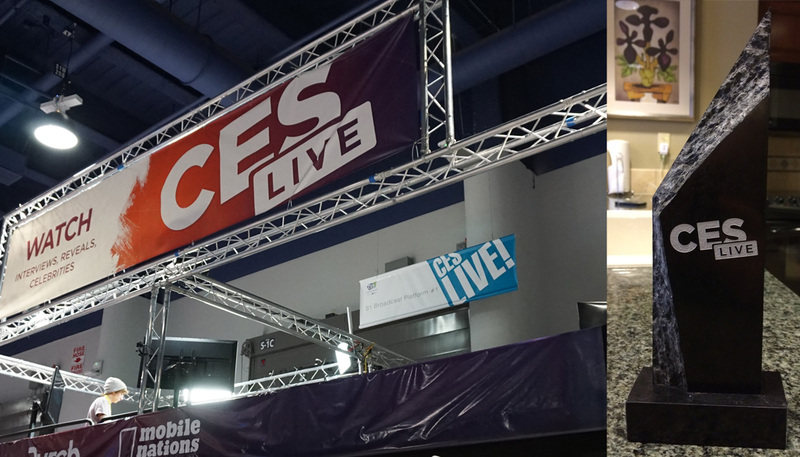 During the four days of CES 2015, we had more than 50 companies join us for our CESlive show. It was an amazing way to see some of the cool technology and innovations on display in Las Vegas. So, what really stood out among the products we had on our show? That’s what our inaugural CESlive Awards are all about. The winners in these ten categories are the items that most impressed us. Fitbit is calling their new Surge a Fitness Super Watch. It features GPS, continuous heart rate monitoring, activity tracking with eight different sensors, sleep tracking, and multi-sport functionality, along with smartwatch features like text and call notifications. The Surge is compatible with more than 120 smartphone models covering iOS, Android and Windows platforms. It also syncs with your computer to deliver all the information it’s gathered into a dashboard application for easy reference and trend tracking. It’s available now for $249. Garmin is a name we’ve known from the world of GPS going WAY back. But did you know they’ve been doing fitness wearables for ten years now? We really liked their Epix, a smartwatch with an emphasis on GPS mapping and compatibility with ANT+ devices. The Epix will be available in the first quarter of 2015 at a price of $550. No more fumbling for your house keys, with Kevo Plus from Unikey. You just need your phone in your pocket, then touch the door lock and it unlocks. There are also key fobs that do the same authentication job, so family members without smartphones can still work the locks. And it can communicate with Nest thermostats to set temperature depending on the preferences of the person who just walked through the door. The Marley One Foundation is the company’s new top-of-the-line audio system, and it’s a beauty. The sound is exactly what you’d expect from the Marley name, with 220 watts of rich, deep, room-filling sound from a pair of 5.25″ woofers and their matching 1″ tweeters. The One Foundation is available now for $999. A lot of us have been using Slingbox for a while, getting our local television delivered to us wherever we are in the world via the internet. The Slingbox M1 is the lowest priced Slingbox so far at $149, and has added built in Wi-Fi so you’re no longer chained to the Ethernet. The M1 gives you features of a streaming box when you’re at home, and delivers your local programming like news and sports when you’re on the road, with no monthly fee. The Slingbox M1 is available now. Artec’s Eva 3D hand scanner is a professional quality handheld device that captures extremely high resolution scans in any environment. And it does it all without lasers. During our interview they showed us a video of the Eva being used to make a head scan of President Obama, with great, life-like results. The Eva is available now for $19,800. A tablet and a stylus can be a very useful combo, but what if that stylus isn’t close at hand? Sometimes, you just can’t remember where you left it. Lenovo’s Yoga 2 Tablet has AnyPen functionality, so you can write on the screen with just about anything – your finger, a fork – AnyPen! And the screen is made of extra-tough glass to resist scratching. Lenovo Yoga Tablet 2 with AnyPen is available this month starting at $299. EcoReco says their scooter is for the last mile, to finish your journey. While that’s certainly true, it’s not a limit. At CES we used EcoRecos to get back and forth between our hotel and the convention center, and to evening events at other hotels. We gave them a solid, real-world workout and they didn’t let us down. It has an official top speed of 20 mph (although we’ve gotten it to go faster) and a range of 20 miles on a charge. It’s a fun and functional way to get around town. EcoRecos come in two models – the M3, which runs $999, and the M5, with rear suspension enhancements, for $1,250. Both are available now. At CES, BMW was showing their new crash avoidance system. It’s so good they invited CES attendees to test drive and TRY to crash it. Nobody could. And their self-parking technology will not only park the car itself, you can even stand on the sidewalk, call your car by speaking into your smartwatch, and the BMW will come pick you up. There is no current announcement on when products using these technologies will be available. Zano is a tiny quadcopter drone with a built-in camera, designed to put aerial photography in everyone’s hands. It offers easy control done through a mobile app, and a follow-me feature that will let the Zano become your own airborne selfie-bot. Zano has just completed a highly successful Kickstarter campaign, gaining £2,335,119 in pledges on an original goal of £125,000. Estimated delivery to backers is June 2015. Thank you to all the companies who shared their awesome products with our CESlive audience! We can’t wait to see what you have in store for us next year!